From left to right: Director of Photography Jeremiah Ysip, Lifestyle Network EP Beverly Desuasido, producer and writer Keesa Ocampo and videographer Rommel Reyes. 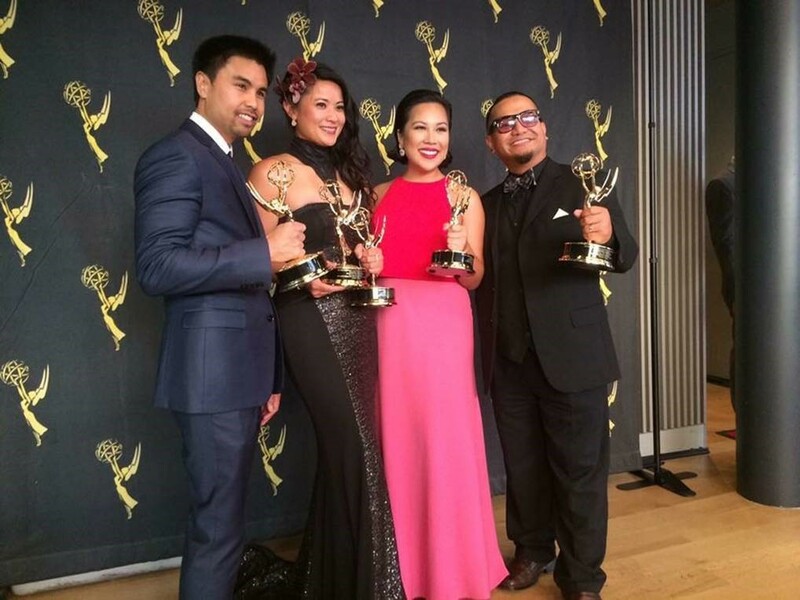 ABS-CBN International, the U.S.-based Filipino-owned and operated subsidiary of ABS-CBN Corporation, has been honored at the 46th Annual Northern California Area Emmy Awards, winning in three categories. LN Tags: Devon Espinosa, the Lifestyle Network feature on mixologist master Devon Espinosa, won in the Lifestyle-Feature/Segment category, beating out entries from KQED 9 and KHON 2/Sprinkle Media Solutions. Spice to Life, the Lifestyle Network's original weekly series, won in the Lifestyle-Program/Special category with its episode that featured San Francisco chef and entrepreneur Tim Luym. The winning entry was executive produced by Clarissa Ocampo, produced by Beverly Tumaneng Desuasido, and co-produced, directed and written by Jon Santos. Nino Nucum served as director of photography. Longtime TFC cameraman Jeremiah Ysip, meanwhile, won in the Photographer-Program category, beating out entries from Comcast SportsNet Bay Area/SFG Productions and KTVN 2. The Emmy award is presented for outstanding achievement in television by The National Academy of Television Arts & Sciences (NATAS). San Francisco/Northern California is one of the nineteen chapters awarding regional Emmy® statuettes. Northern California is composed of media companies and individuals from Visalia to the Oregon border and includes Hawaii and Reno, Nevada. Entries aired during the 2016 calendar year.